Configurator 360 is No Flash in the Pan! Configurator 360 is No Flash in the Pan! Home › Visitor › Configurator 360 is no Flash in the Pan! Configurator 360 is no Flash in the Pan! In my email a few days ago, I found an invite from somebody in the ” Information Technology and Services” sector to join their professional network. I accepted (not really sure why), and soon received an email from the person outlining the type of services they have to offer ― mostly web-based programming. Nothing unusual, but there was a link that they appear to have targeted to me (and likely anyone else with the word “configurator” on their profile), that went to a portfolio page showing an online 3D configurator they had created for one of their clients. Judging by the “flash-and-flex” in the URL, I am guessing that this configurator is a 3D animation that is choreographed by the user……… which is pretty interesting. You see, I was part of the beta testing of a cloud configurator service by Autodesk called Configurator 360 ― which is an actual product engineering/design configurator. There is a big difference between the two. Configurator 360 is now a live product, and although it is still in its infancy, it shows tremendous potential. An animation that shows a product being configured is just that. An animation. It is not directly tied to the actual product, and begins down the road to obsolescence the minute it is completed. Every little adjustment made to the product must be carried over to the animation, or the animation no longer represents the product. This schema is not only ripe for errors, but has the potential to quickly become a money pit. Configurator 360 on the other hand is a whole different animal. With Configurator 360, you use a real-live engineering/design configurator that can be used to configure ANY configuration within it’s baked-in limits, and the resultant 3D model can then be used to create the actual product that was just configured! Let’s say you produce a product that can be modified in a myriad of different ways ― lots of accessories, different lengths and diameters and a variety of materials ― you have tons of possibilities, but currently you only have a few models created along with many lists of options. Your clients need to picture their dream product because you cannot be expected to design every variation on the chance that someone will want that odd-ball configuration. Right? Absolutely not. If you want to sell all possibilities, you need to be able to show them. And do so quickly and accurately. This is where configurators shine. A configurator is like an engineering/design wizard that knows all of the capabilities and limitations of your shop, and will allow you to quickly configure a design that is within your manufacturing/design capabilities ― it’s all baked right in! No more hunting for old drawings or looking up specs! The latest and greatest design is always at your finger tips! And you can build costing right into the model so that you not only have a design never seen before in seconds, but costing as well! Go give our Cabinet Configurator a workout over on Autodesk’s Configurator 360. Imagine your clients configuring the product they need, and hitting an order button that sends a work order complete with drawings to the factory, or possibly sends the configuration along with notes to a sales person? The possibilities are endless! If your competition gets her before you, will you ever be able to catch up? Don’t take the chance. Contact Cindy with any questions you may have. 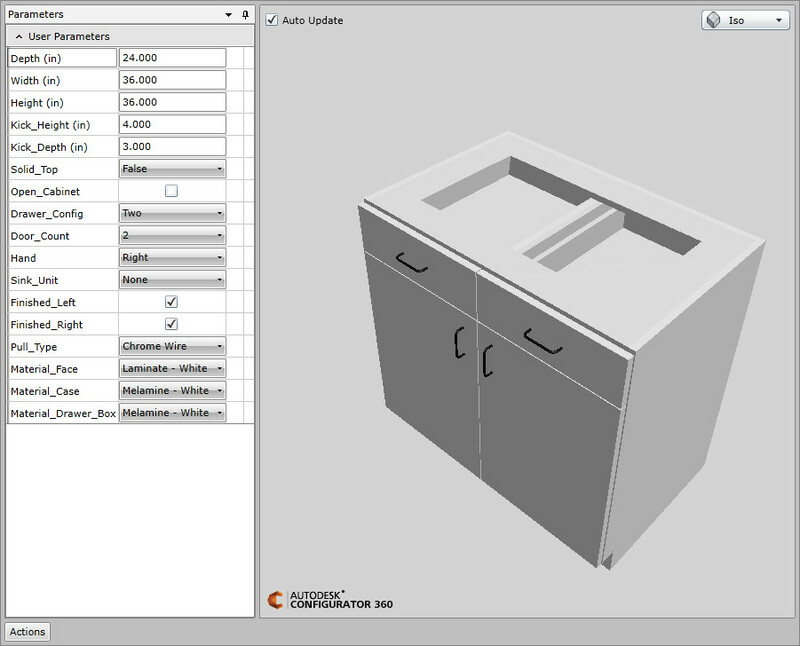 We build Autodesk Inventor configurators for ANY product, and would love to hear from you! 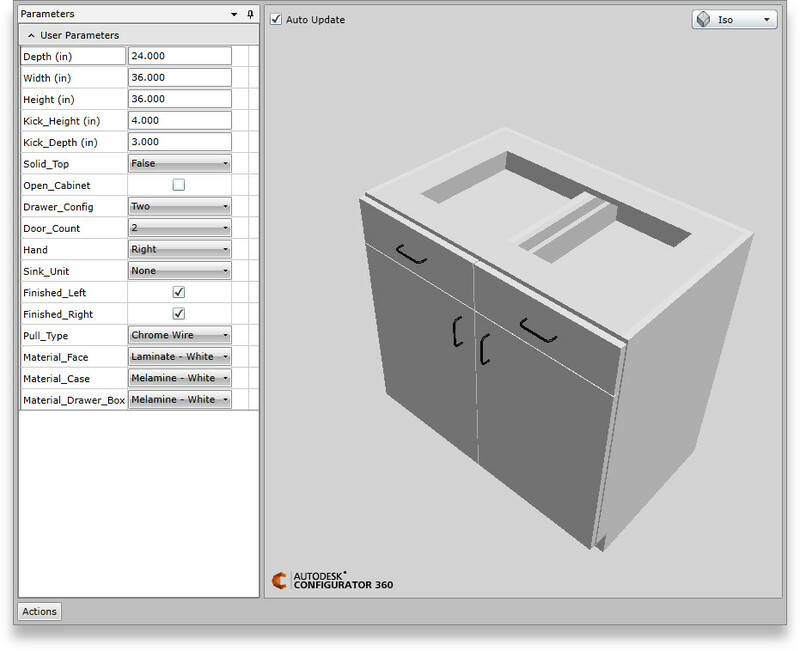 Select: Configurator for Cabinetmaking - Room Creation Cabinet Configurator Placement Online Configurator - Autodesk Inventor Automated Face and Grain Direction Edge Banding With Inventor Configurators Configurator Functionality Expanded Configurator 360 is no Flash in the Pan!